520 persons arbitrarily detained in Homs Central Prison began a hunger strike on Tuesday, 17 October 2017 demanding their immediate release after spending several years in arbitrary detention. These demands were renewed in the aftermath of direct threats from the “new administration” of the prison, represented by brigadier Bilal Suleiman Mahmoud. These threats began with cutting of the water and electrical supplies for several hours during a failed attempt to storm the prison. The prisoners are in control of two buildings in the prison, in protest of possible referral of several of them to exceptional courts and security branches. 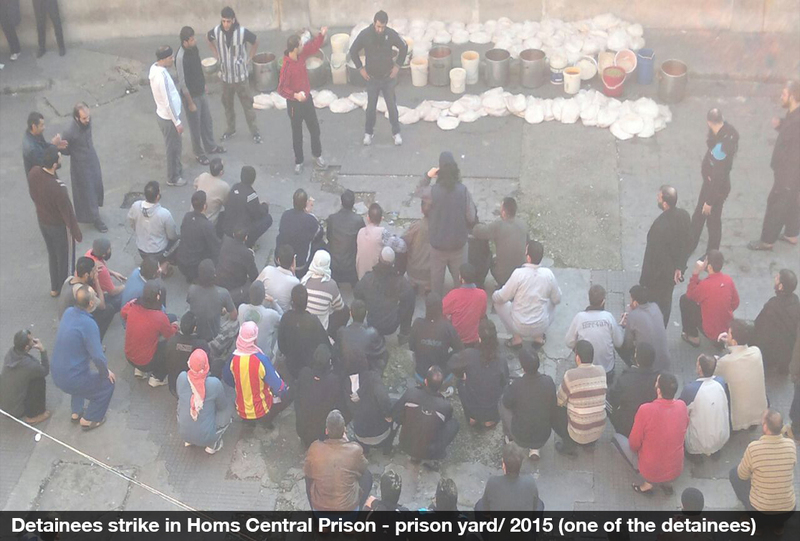 The situation of Homs Central Prison came to the forefront after a visit to the prison by a delegation from the International Committee of the Red Cross (ICRC) on the 16th of October 2017 to review the health situation of prisoners, the quality of food provided, and other relates issues. However, the prison administration monitored the interviews by insisting on the attendance of the prison police members during the interviews. This prevented prisoners from fully presenting their demands to the ICRC, especially the demands of 492 individuals imprisoned as a result of the conflict in Syria, who have spent several years in detention (most of the earlier detainees were referred to security branches in 2011 and 2012). According to reliable sources based inside the prison, there are (28) detainees in danger of being referred to military field courts, in addition to (462) detainees who were referred to the “Terrorism Court” which lacks international standards towards the conduct of fair trials. In addition, (30) detainees are being held for different criminal reasons. The prison’s director continues his threats to storm the buildings where prisoners are held, broadcasting them through the prison’s intercom system. Detainees reported that the prison director also threatened to burn them with their families. The undersigned organizations demand that the Syrian government immediately accept the demands of hunger strikers, particularly those related to their right to not be subjected to ill-treatment, or prolonged arbitrary detention any longer. The signatories also demand that Syrian authorities refrain from referring prisoners to military field courts or other courts, such as “the Terrorism Court,” and to stop all arbitrary executions.